Siri Rustebakke and her husband, Amund, left the Begna Valley of Valdres, Norway, in 1866 and settled in Section 27 in the Town of Black Earth. They moved to Webster County, Iowa, in 1875. Compare with Image ID 26517.This image is part of a larger collection of images created by Andreas Larsen Dahl, a Norwegian immigrant photographer who worked in Dane County, Wisconsin throughout the 1870s and early 1880s. Dahl was, by his own words, an "artist." His early photographs are similar to that of other landscape photographers who traveled the countryside in horse-drawn darkroom vans. Dahl lined up families in front of rural and urban houses. 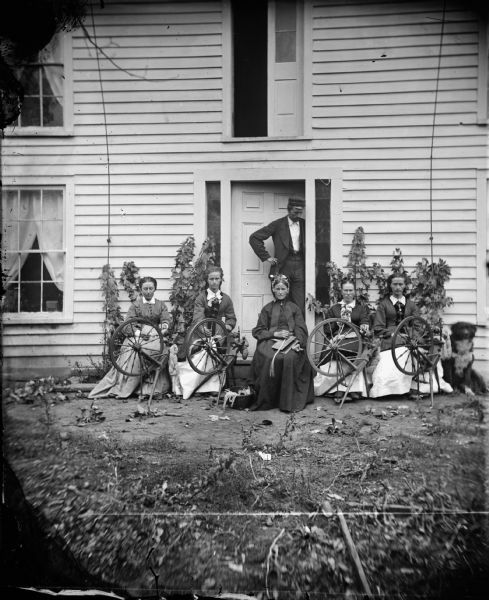 He induced his subjects to haul their parlor possessions out onto the front lawn, creating a family leisure scene in front of their house. Through the course of his career, he chronicled both rural and urban life of Norwegian immigrant families in Dane and surrounding counties. In 1883, he left photography to join the Norwegian Evangelical Lutheran Seminary, and was ordained as a minister.